We’d love your help. 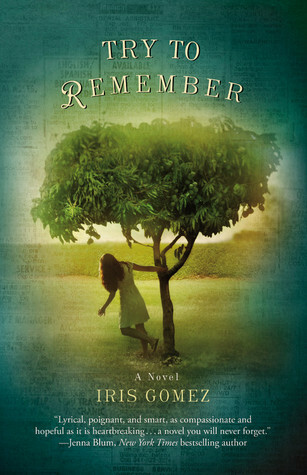 Let us know what’s wrong with this preview of Try to Remember by Iris Gómez. To ask other readers questions about Try to Remember, please sign up. Happy that Gabri is a successful immigrant lawyer. Book was toooooooo long. I heard the author speak in the fall, and I'm pretty sure someone said this coming-of-age novel is based on her childhood. It's a window into the family insularity of some Colombian immigrants in Miami in the mid-20th century. I think the family members' maddening refusal to ask for help from close friends or institutions would be more understandable if bad things actually happened when they finally went to the police or the hospital--I am sure many immigrants do have bad experiences with author I heard the author speak in the fall, and I'm pretty sure someone said this coming-of-age novel is based on her childhood. It's a window into the family insularity of some Colombian immigrants in Miami in the mid-20th century. I think the family members' maddening refusal to ask for help from close friends or institutions would be more understandable if bad things actually happened when they finally went to the police or the hospital--I am sure many immigrants do have bad experiences with authorities--but maybe the author was just sticking to the facts of what happened in her life. She follows the sequence of events even when compressing incidents would have made more literary sense. First this happened, then that, then the next thing. The writing is not artful, but the story holds your attention. Still, I know that many children lack the kind friends and teachers this person had reaching out to her all the time. Many children, if they had even one such kind person, would have responded and been grateful for the help. But in spite of the father's clear derangement, the girl and her family went for years just adapting, lying, hiding, denying, suffering. Pretty frustrating to read. This story had a way of capturing you to keep reading. The book could of been about 100 pages shorter due to the monotony of the storyline in the beginning. I think after the few couple of incidents the reader can grasp the concept that something isn't right in the family structure. I was rooting for Gabrieleta to break out of the family tradition and become her own person. Her mother i could've strangled. I can understand the situation but there just comes a point where a mother and a human bei This story had a way of capturing you to keep reading. The book could of been about 100 pages shorter due to the monotony of the storyline in the beginning. I think after the few couple of incidents the reader can grasp the concept that something isn't right in the family structure. I was rooting for Gabrieleta to break out of the family tradition and become her own person. Her mother i could've strangled. I can understand the situation but there just comes a point where a mother and a human being can only take so much. Once it was revealed about the father i had no sympathy with him. I received this book for free through Goodreads First Reads. I would like to thank Goodreads & Iris Gomez for giving me the chance to read this book. I believe anyone reading this will be doing a lot of thinking & possibly trying to put themselves in Gabi's shoes. At least that seemed to be what I kept doing...and it was impossible for me to even imagine living the life that they were living. But I kept trying anyway. Very thought provoking. I loved this book about a young immigrant woman/teenager and how she navigates the divide between her Columbian birthplace and Miami, where she now lives with her family. The book totally captured me. It is written so vividly and opened a door for me into her life and famly struggles. Gabriela is the star of this novel but the other characters are just as compelling. It's a page turner and you will want to stay up all night reading. I could relate to the main character because of the language she spoke and the ways of Hispanic families. It was sad to read how broken the family was. The book was long and repetitive. I did enjoy how strong the main character was although the environment she was living in was unhealthy. This book shared a bit of the struggles families of immigrants endure in starting a life in America and also the physical abuse of domestic violence. I liked this book. I agree with other reviewers that it was repititious. The book gave me an insight into growing up bright in a latino/old world environment. One of the reviewers on Goodreads said that the book is semi-autobiographical. Wow, I can't imagine succeeding from this background but Ms Gomez has. The teachers are almost too good to be true. The helpful neighbor is a bit phony. I liked the book with reservations. I received this book in a giveaway. When I first started it I thought it was too depressing with too much Spanish in it. However, by the end I was "with" the heroine, empathizing with her and came away with good impressions of the book. Gabriela had to go through a lot but in the end things are looking up for her! I won this book on Goodreads First Reads. I enjoy stories about teenage girls and their struggles. This girl was very likeable and sympathetic. Her family on the other hand, was not. There was too much emphasis on the father's illness and violent temper, in my opinion. And I thought the ending left too much unresolved. This story is about a young immigrant teen and her family living in Miami. I found myself totally wrapped up in Gabriela's life as she struggles to keep her family together. The weight of the world is on her shoulders as she tries to remember good things in her past. Interesting and well-written story. I found this book when I was browsing a bookstore in an airport. I liked the topics of immigration, mental health, and loyalty to family that the author covers, although I didn't find that the writing was particularly outstanding. This was not as good as I expected it to be. I read some reviews and I thought more of the book would follow the father's mental illness but that wasn't the case. It was a good enough read for me to make it to the end! Really wanted to like this book but such a struggle to finish it. There were a couple of points in the book that I thought "yes, it's getting better" only to be disappointed to end up back where it started from. The story line had potential but seemed never to get off the ground. I understand the issues that Iris Gomez is addressing and for that I give the book two stars. I just simply did not find it well written. The narrative was jumpy. Except for the narrator, the other characters were not fleshed out well enough to be engaging. A surprising pleasant read. This is written from a teenage girls viewpoint. Her family is from Columbia and currently living in Miami. She struggles with family problems as well as differences in culture. It is an easy light summer read. This review has been hidden because it contains spoilers. To view it, click here. This was a pretty good book but I found myself skimming a bit at certain parts. Part of me really wanted to find out what happened to Gabrielita but I understand ending like that - leaving the reader with hope for the family. It took me three days to get through 60 pages of this book. Hardly any dialogue, so it was hard to be engaged with the characters. It was also hard to know where the story was going. This was sort of like Next to Normal meets immigration meets the 1970's. I liked it but it was a real downer. Fantastic look into a young Columbian teenagers life in Miami. Internal struggle and family struggle take you to emotional places that test the view of what life must be like as a poor immigrant. This novel was good but exhausting with the father's slow decline with mental illness. You also get a good sense of life for new immigrants and their fear of being deported. It is definitely scarier to me when the dad has the crazy. (...instead of the mom) No idea why. Had the pleasure of meeting Iris Gomez, and she is delightful! I really enjoyed this coming of age novel of a Columbian girl living in Florida in the late 60s/early 70s. Insightful, sharp, and just a little bit painful. Recommended. Excelent story of a Columbian girl in Miami, and how she adjusts to different customs, her family struggles, and growing up. IRIS GÓMEZ is an award-winning writer and nationally-recognized expert on the rights of immigrants in the United States. She is the author of two poetry collections, Housicwhissick Blue (Edwin Mellen Press, 2003) and When Comets Rained (CustomWords, 2004), which earned a prestigious national poetry prize from the University of California. Her work is widely published in a variety of literary and o IRIS GÓMEZ is an award-winning writer and nationally-recognized expert on the rights of immigrants in the United States. She is the author of two poetry collections, Housicwhissick Blue (Edwin Mellen Press, 2003) and When Comets Rained (CustomWords, 2004), which earned a prestigious national poetry prize from the University of California. Her work is widely published in a variety of literary and other periodicals. A respected public interest immigration lawyer and law school lecturer, she has represented civil rights groups and individuals in high impact cases and won professional awards for her accomplishments–including a Las Primeras award for Latina trailblazers in Massachusetts. She has frequently been called upon to write and speak on immigration-related topics and has appeared in the media, including on the nationally televised Cristina show and Boston’s celebrated bilingual late-night radio program ¡Con Salsa! An immigrant from Cartagena, Colombia, she spent formative years in Miami, Florida and has also lived in New York City, Michigan, and throughout the Pacific Northwest. She and her family now make their home in the Boston area.